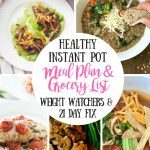 Looking for a Healthy Instant Pot Meal Plan for the 21 Day Fix or Weight Watchers? I have one PLUS a grocery list for you! Tip: I love this with my Freezer Friendly Instant Pot Brown Rice! Tip: My favorite sides to go with this dish are green beans or asparagus and Freezer Friendly Instant Pot Brown Rice!